Dr. Gallus and Dr. Douglas discuss breast implant capsular contraction including prevention, risk factors, and treatment. To talk to you today about breast implant capsular contracture. Capsular contracture has no specific known cause. There are several prominent theories and we address each potential cause during your treatment with us, to give you the best overall results. There are some known risk factors of capsular contracture. These include smoking, post-operative bleeding or infection, a periareolar incision approach, and a history of radiation therapy to the breast. Management of capsular contracture includes prevention by minimizing the risk factors before, during, and after surgery. For advanced cases of capsular contracture, surgery is required to remove the scar tissue capsule and replace the implants. 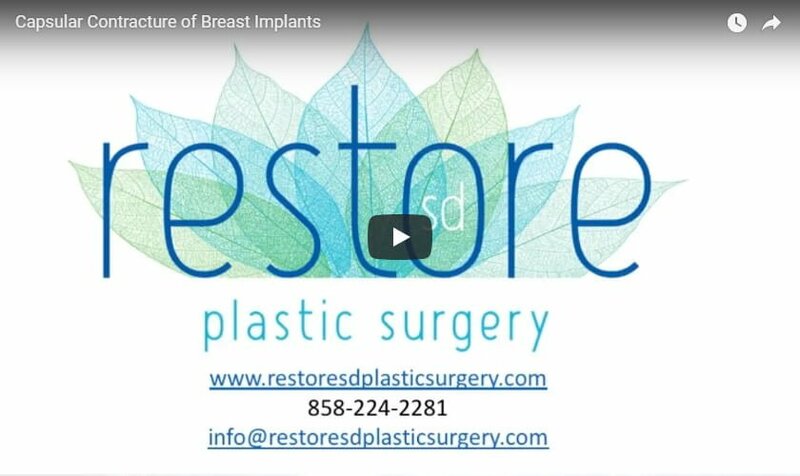 If you’ve had previous breast surgery and have concerns of capsular contracture, we welcome you to visit us at Restore SD Plastic Surgery where we have over a decade of experience in breast surgery.